The red-bellied piranha (Pygocentrus nattereri) is a South American freshwater fish that's known for its uber-sharp chompers and opportunistic dining ways. Red-bellies feed on lots of meat-based sustenance, which include crustaceans, bugs, amphibians, worms, birds, snails and fishes. In most cases, these piranhas do indeed sport crimson undersides, in line with their naming. Red-bellied piranhas have somewhat fierce public images, even though they're frequently used as food fish. Those razor-like, angular teeth rarely sink into human flesh, although sometimes a hapless piranha might take a bite out of the careless fisherman who caught him. People aren't the only predators of the species, either. They're also on the menu of big fish, crocodiles, dolphins, birds and turtles. When they look for food themselves, they usually do so at the end of the afternoon or during the night. These mid-sized fish are a common sight all over South America, where they are native to most nations, including Venezuela, Brazil, Bolivia, Argentina, Uruguay, Peru, Ecuador and Colombia. The Amazon Basin is one of the primary haunting grounds of red-bellied piranhas, as is the Parana Basin. Although South America is the species' home base, individuals have, on rare occasion, been spotted in waters of the United States, most likely due to accidental "escapes" from captive aquarium environments. 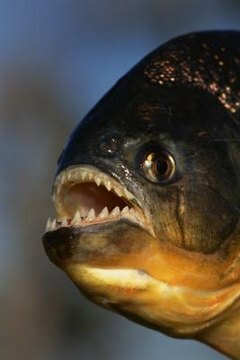 Red-bellied piranha sightings have occurred in Massachusetts, Hawaii, Oklahoma, Virginia, Florida, Minnesota, Nebraska, Michigan, Ohio, Kansas, Washington and Pennsylvania. They have also been seen in Ontario, Canada. Red-bellied piranhas are extremely prevalent in aquariums. Red-bellied piranhas frequently reside in whitewater, rather than blackwater streams and rivers. They also often establish themselves in lakes, tributaries, wetlands and creeks. Flooded forests are also typical locales for these toothy fish. Red-bellied piranhas tend to gravitate toward rapidly flowing water environments that offer ample sustenance. Members of the species usually remain together in shoals. Despite being considered fierce, it's not rare for red-bellied piranhas to live closely alongside people. In some cases, people even swim in waters that are inhabited by these guys. What Eats a Red-Tailed Nile Catfish?